Their’s is a real love story. Angela was studying in Trinity College and Adam was her tutor. Love at first sight for Adam and that was that. 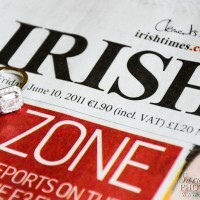 that little blue box from Tiffanys and Angela said “I will ” and so the wonderful journey to their wedding day began. 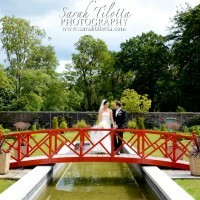 They went to visit the romantic Lough Rynn Castle and the venue was decided. Considering that they would have friends travelling from the States, where Adam was working, a Castle in Ireland was just the ticket to impress their guests. 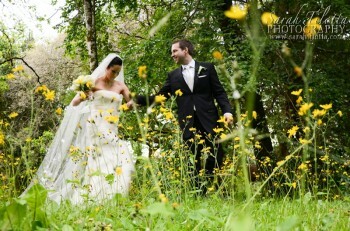 Adam and Angela decided to have their wedding ceremony in cute little country church in Bornacoola, Co. Leitrim . A very old country church set amongst towering old trees in a tiny village close to the castle. They chose Pretty As A Picture for the elegant letter press invites, the invitations were sent out and the hunt was on for “The Dress”. Angela got her stunning Vera Wang dress in the USA. The style really suited her and flattered her lovely figure. 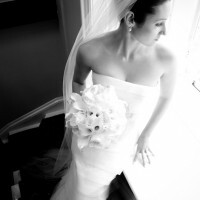 She wanted simple and elegant flowers, nothing too dramatic, the dress was the statement. She decided on a simple bouquet of calla lillies and avalanche blush roses supplied by Margaret in Calla floral Design. Make-up was done by the friendly Alyson who was a big hit by all the bridal party. The ceremony in Bornacoola church was performed by a family friend, Father Derek. One of their friends surprised them with a renedition of a U2 song at the end of the ceremony. 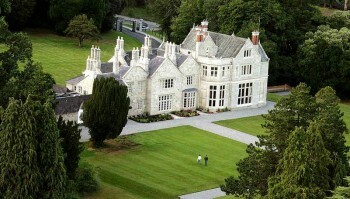 After the ceremony it was back to the magnificent grounds of Lough Rynn Castle, where the guests were greeted with champagne and serenaded by the Bohemian String Quartet. The wedding reception was very elegant and simple in style, centrepieces on each table in tall martini glasses. A photo booth with lot’s of props provided much entertainment to the guests, who partied well into the night dancing to the sound of The Camembert Quartet. I loved working with Adam & Angela and wish them well in their new life together in London.